So I’ve made a commitment to myself to actually give both candidates for president a fair run at my vote this year. They both picked VPs that would allow me to vote for either of them. There are only three people who would have swayed my vote one way or the other (Hillary, Mitt, and Joe Lieberman). I decided to watch both parties conventions, especially the acceptance speech. This required lots of dedication, stamina, and the ability to stay awake on my couch while watching “Prime Time” coverage. Since when is 10:30pm prime time, anyway? So no decision on my part, but I did come up with a completely reasonable criteria for selecting the president. Yes, confetti. 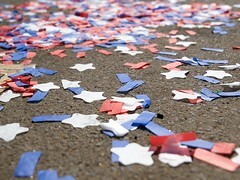 You should be able to tell exactly who you want for president by the quality of the confetti used after their acceptance speech. I mean, really, why wouldn’t you? It’s a sign that they know how to select a good planner, that they have good taste, and are willing to shake things up. Not like that other guy… His says “I’m oddly creepy, and my wife needs a new hairstyle. If I get elected, my VP can tell my wife where she get’s her hair done.” Not exactly the message you want to sell the confetti voting public. Not at all. On the other hand, if you’re in the balloon voting public, the Democratic candidate would have left you wanting. No balloons in Denver. 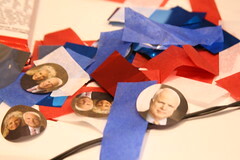 John McCain won that contest hands down. 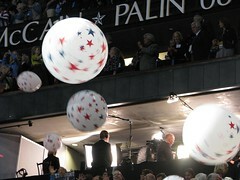 They even threw in some giant balloons with stars! Previous PostCSA Pickup #7 – Tomato timeNext PostWhy are you voting for Obama?